On Saturday evening, many American children will encounter costumed ghosts as they roam the streets in search of candy and other treats on Halloween. Before bedtime, to avoid nightmares, some parents may try to reassure their kids that ghosts are not real. 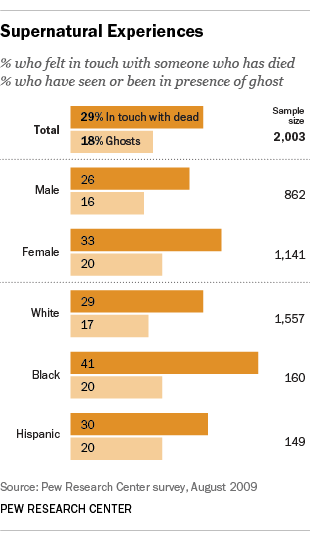 But not all of those parents may buy their own reassurances: Nearly one-in-five U.S. adults (18%) say they’ve seen or been in the presence of a ghost, according to a 2009 Pew Research Center survey. An even greater share – 29% – say they have felt in touch with someone who has already died. Claude Fischer, a professor of sociology at the University of California, Berkeley, explored Americans’ persisting beliefs in some supernatural phenomena in a 2013 blog post. Does going to church help keep ghosts away? It’s impossible to say, but people who often go to worship services appear to be less likely to say they see ghosts. Just 11% of those who attend religious services at least weekly say they’ve been in the presence of a ghost, while 23% of those who attend services less frequently say they have seen a ghost, the Pew Research Center survey found.